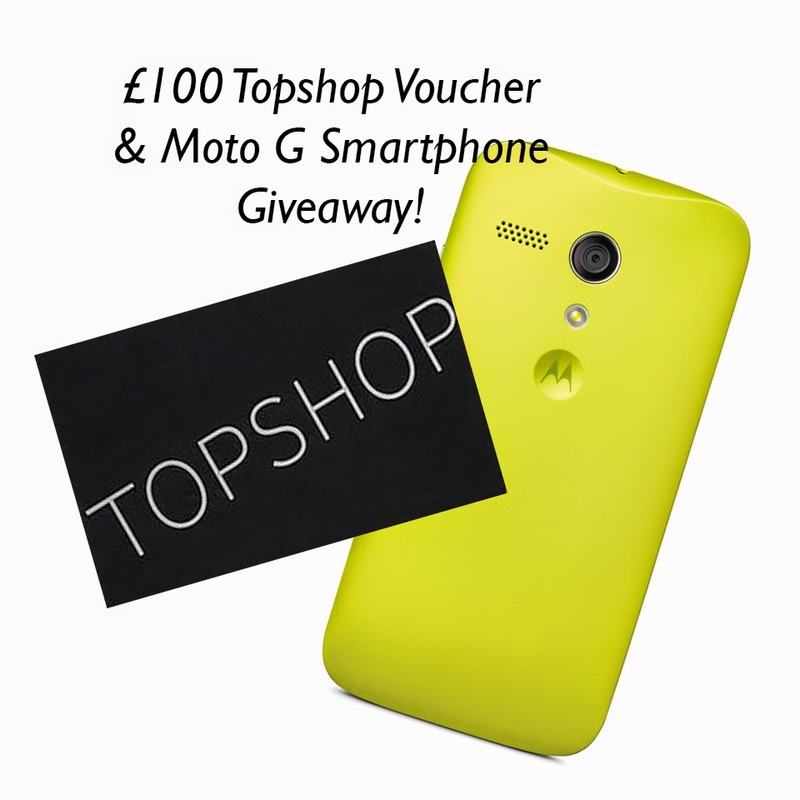 I've wanted to do a nice big giveaway to thank you all for reading my ramblings for a long time now, so I was very excited when Motorola said I could not only treat one of you lovely lot to their latest smartphone- the Moto G- but also a £100 Topshop voucher! The Moto G is Motorola’s best-selling smartphone with an accessible price point that has enabled Motorola to connect more and more people around the world. It's perfect for us bloggers because it's super speedy on the internet and seriously stylish too. You'll even get an extra coloured shell so you can match your phone to the outfit you buy in Topshop! So if you fancy a bit of a technology and wardrobe update don't hesitate to enter via the quick and easy rafflecopter form below (Make sure to at least follow my blog and twitter- where I'll be announcing the winner- and leave a comment!). Good luck! Amazing giveaway! Thank you for doing this! I would buy lots of jewelry, lipsticks and pastel clothing items if I won the £100 Topshop voucher. I'd buy a new bag and bikini and some of their gorgeous new jewellery! I'd love to buy lots of gorgeous pastel pieces of clothing for spring :) from Topshop. I love the look of this phone too, I haven't had a Motorola since 2006. Thanks for the giveaway lovely. Such a good giveaway! i would buy some joni jeans for sure and a new bikini! Such an amazing give away, fingers crossed! I'm in need of some pretty dresses! something pretty and pastel - maybe a mint coat? I definitely need to update my Topshop Lipstick collection! Alongside the new Folk Print Stud Crop Top! I would definitely buy myself a graduation dress, and update my summer make up bag!!! Would love to win!! i'd buy a maxi dress! something very floral printed dress !!!!! Exciting giveaway! I'd probably invest in some good topshop jeans that will last me for ages, or some new sandals. Omg how totes amazing! I'd love to win because 1- my iPhone broke and I had to sign up for another two year contract with the same boring old phone as before and 2- I have lost two dress sizes (yippee) and now require a whole new wardrobe...hello topshop! Great giveaway, I would love to get a summer dress. Love your blog! LOVE your vids and blog posts! im lusting over some topshop dungarees and would love to win!! amazing giveaway - in desperate need of a new spring/summer wardrobe and so this would be perfect! The Poppy Bloom Maxi Skirt with a new stylish bag. I would probably get some high-waisted shorts! Great giveaway thanks! I would buy a new Summer jacket and some flipflops! I think I'd buy a maxi skirt:) great giveaway! I'd have to get myself some new jeans, my current ones are on their last legs (sorry for the pun). I'd buy the Leather Daisy Crossover Bag I've had my eye on for a wee while. I am in desperate need of spring/summer tops & dresses, especially since I just dyed my hair back to fun colors (purple to pink ombré), and I'd love some stuff that makes my hair pop even more! And definitely a pair of jelly sandals!! A must have. I would buy http://www.topshop.com/en/tsuk/product/clothing-427/knitwear-444/pretty-necklace-sweater-2730194?bi=21&ps=20 this cuuutesey little jumper. Perfect knitwear while spring is still a little bit chilly, but a bang on trend mint colour and lots of sparkly gems yay! I'd buy a beautiful pastel handbag to carry my Moto G in if I was lucky enough to win! :) As well as some more pastel pieces! I have my heart set on a bright dress like the Yukka Yukka Tulip dress to look good on a sunny day. I would a nice flattering maxi dress for this warmer weather. I think I would buy some cropped trousers with a matching top. Love the match sets!! I'd buy a pair of white platform sandals as they're very stylish at the moment and would keep the style very spring and stylish at the same time! I'd love to get this dress! i want to buy the black PEPLUM LACE CAMI and the FLURO FOLK PELMET SKIRT its so beautiful for the summer!!! I need! Theres so much stuff I want from topshop right now! Great giveaway! Just in time for summer shopping. I'm loving Topshop's running short range. This is another amazing giveaway, fingers crossed as always! That would be one amazing shopping trip! What a lovely giveaway! A new bag to keep the lovely phone in. Perfect giveaway - I've got my eye on some bright coloured leather jackets. i would love to win the voucher! This is such a great giveaway! Thanks for the opportunity! I want to get a cute summer dress! I wanted to get the Moto G actually as my next phone as mine just broke! Would LOVE to win this! I would love to buy the tropical shacket and a nice colorful bikini. I would love to buy a pair of white jeans! I just love them for those chilly but sunny days! The Topshop pink mega cut out boots are right up my street! Amazing giveaway lovely, thanks for the opportunity! Floral print blouse and sandals. i'd maybe a pastel bag and some bold statement pieces from topshop! I'd probs buy some white skinny jeans! i would get one of the party dresses! I would love to buy a Maxi Dress! I would get my GF a party dress. I might get the MOTO Blue Gingham Joni Jeans. Any of their jeans would be perfect! I'd probably buy one of their leather jackets ! I am all over this super vintage style bardot crop http://www.topshop.com/en/tsuk/product/new-in-this-week-2169932/new-in-this-week-493/petite-crinkle-bardot-suntop-2898453?bi=21&ps=20 with their stunning white quilted midi skirt, some cat eye sunnies & a fedora! I would buy some great summer clothes!